Is there an application for always-on-top replica windows of apps in Linux? Hello, I was using OnTopReplica on Windows, to be able to see the Discord's video call while I was using the PC (even in full-screen apps), just like in Skype's small window. I'm still using Discord on Linux Mint, but I couldn't find such an app. Shall I try to use the app I used in Windows with WINE or is there something I could do on Linux to make the Discord voice call window smaller and appear always-on-top? Thanks. 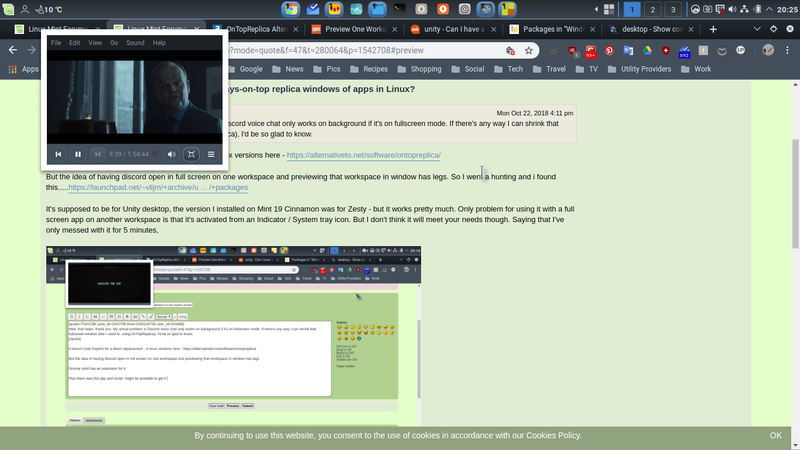 Re: Is there an application for always-on-top replica windows of apps in Linux? What Desktop Environment are you using? In Cinnamon you can right click on any window title bar and pick always on top. I've just checked and this works over full screen apps (with the side effect that the panel still shows unless it's set to auto-hide). Well, that helps, thank you. My actual problem is Discord voice chat only works on background if it's on fullscreen mode. If there's any way I can shrink that fullscreen window (like I used to, using OnTopReplica), I'd be so glad to know. Like smurphos said, I'm pretty sure all editions of Linux Mint can right-click anything running in its taskbar and choose "Always on Top" or "Keep Above Others", etc... If You use multiple workspaces (virtual desktops) and or monitor screens, you can also move an application like Discord to another workspace (desktop) or monitor screen and easily switch back and forth between the workspaces using the mouse or keyboard. FYI: There are some really good applications like "rambox" and "Franze" that can run one or more messengers at one time. Some people prefer using "rambox" for Skype over the Skype for Linux application. ramboxapp/community-edition: Free and Open Source messaging and emailing app that combines common web applications into one. Observation: I can only resize (shrink) the Discord messenger application window to certain minimal size and then it will not shrink any further which is due to their developers not Linux. Last edited by phd21 on Mon Oct 22, 2018 3:37 pm, edited 2 times in total. It's supposed to be for Unity desktop, the version I installed on Mint 19 Cinnamon was for Zesty - but it works pretty much. Only problem for using it with a full screen app on another workspace is that it's activated from an Indicator / System tray icon. But I don't think it will meet your needs though. Saying that I've only messed with it for 5 minutes. It's kind of cool. Another idea would be to run another Mint install in a VirtualBox and run discord full screen in that VirtualBox - but have the Vbox window shrunk and pinned, or use the tool above the preview the Vbox window.